Let me start this post by emphasizing how much this trip means to me. I've been trying to go to Europe since I was... I can't even tell you. Six years old? Probably about as long as my Mom has been telling me her travel stories. Once upon a time, my Grandfather worked for Pan Am Airlines as a mechanic. Due to his affiliation with the airlines, my mom (and her 5 siblings) flew stand by everywhere. Could you imagine?! I'm going to go ahead and stop there before I go on a rant about my mother's journeys because, let me tell you, there are a lot of them. You will get jealous, just as I've gotten jealous for decades. 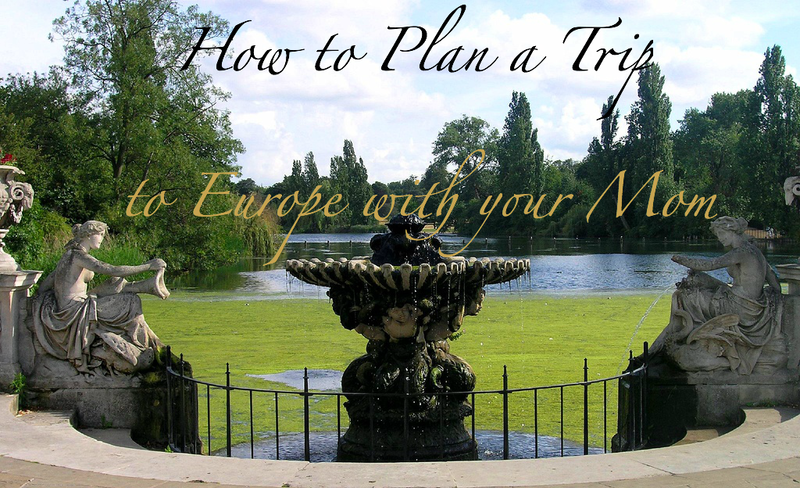 1) Start by telling/asking you Mom that you want to go to Europe. I know pretty basic but I saved for over two years before I could actually afford the trip my Mom and I have planned. I also made it a surprise trip for her. At first, I wanted to book the entire trip without telling her anything and then decided the only thing I would give her was a heart attack. Plus, I realized that planning was going to be the most fun! 2) Make sure you can agree on a budget. I actually had to save for a bit longer even after we finally planned out trip. Granted, it might be a bit easier if you're splitting the trip with her or if you're fortunate enough to not be concerned about budget. I think it's a great way to actually plan your trip though because you'll find out what you truly want to do at the very beginning. 3) Choose your destinations. I've always wanted my first trip to Europe to be to Paris. I thought my Mom would be so stoked. Apparently, my world traveler of a mother, doesn't think Paris is all that wonderful.... Who doesn't think Paris is the most magical place on Earth?! Someone who's seen the Italian Coast and the other magical wonders of the world. We ended deciding on London first. We figured we'd start out with an English speaking country and work our way into another. Since this is my first trip, I was concerned about going to any other country than France because that's all I've studied through out High School and College. After, my Mom was gushing about Italy and how she hasn't been there since she was in Boarding School. She spoke about going to the Spanish Steps and how she'd love to see The Vatican as an adult to logically Rome just had to be the second half of our trip. 4) Decide what kind of a trip you want to have. My Mom has a problem with her feet. She can't walk for great, long periods of time and I needed to keep that in mind for our trip. My biggest concerns about escorted travels was that we'd be hustling and bustling around without anytime to really breathe and let her rest up. We decided that we wanted to be able to have days of leisure. Luckily, she's totally happy with her feet up, a cup of coffee and her kindle at the local park while I venture out to the Victoria and Albert for a few hours. With this is play within the plan, we also decided that a few tours were essential and that's when we really starting talking about the trip we were both expecting. 5) Decide the area you want to stay in. As I spoke about before, when my Mom was in boarding school in Rome, all she remembered was how much she loved the Spanish Steps and how much she wanted to stay there. It's a terrific thing she brought this up because once we really started looking at hotels the cheaper ones were in (being political here) "an unattractive area". In short, we're two women on vacation alone and we really wanted to be mindful of our surrounding. To put ourselves at ease, we decided a middle range hotel was a bit more acceptable and we would kick off one of the tours we planned to do. It really wasn't going to be too much on my Mom anyways. As for London, we're right next to Kensington Palace and it's going to be worth every penny! 6) Find the right time of year to go. A lot of this can depend on airfare prices and that's totally understandable. We decided based on airfare and when the best time of year it would work around our work schedules. I work for a company that has a HUGH increase in workflow around the holidays so summer is the best time even if it is "tourist season". However, we chalked it up because se can eat gelato & sorbetto everyday when we're in Italy. 7) Figure out how you want to book your trip. Truthfully, I follow Gate1Travel's promotions like it's my second job. I actually waited until their Black Friday sale last year so that I could save money. We ended up saving a great deal AND we got spectacular hotels for a terrific rate. What I love about this site is that you can add on tours or you can book through another company. There's no penalty for it. You can also get traveller's insurance through them and they're very reasonable. One of my great friends has booked 3 trips with them and came back with so many amazing stories. In the end, it was cost effective and made the most sense for our trip. We really love being able to customize everything. I haven't even been on this trip yet but I know that my next trip will more than likely be through them. 8) Make sure your passports are up-to-date. I definitely kept forgetting to renew my passport and it took me finally booking my trip to get it taken care of (the stubbornness comes from my Dad's side, just ask my Mom). This can take some time so keep that in mind for just when you're going. We booked our trip 9 months before we're actually going. Which, turned out great cause I need to get everything taken care of... including getting a new photo. 9) Give yourselves time. We are not the type of travelers that like to plan our full day. We are the type of travelers that have a rough outline of our day but mostly play it by ear. Giving ourselves 9 months is more than perfect for us because we love the trill of preparing for the trip. My mom got an italian CD from the library so she can practice in the car to and from work. She's been trying to find comfortable sandals since the day we booked it. Meanwhile, I've watched every Rick Steve's youtube video known to man and I've got an Italian app on my phone that I try to do twice a week. I getting good! I can say more than "She eats the egg"! 10) Be respectful of each other and have a trip to remember. I'm SO beyond excited for this trip with my Mom because I know it's going to be a once in a life time opportunity. I know we are going to have a wonderful time and that it will help up become closer. I think it'll bring us a new found respect as well. I've already seen her trying to remember and re-learn from all those years of traveling. She's been trying to catch up on what she's missed from her days in Rome. She's started to already teach me what I should be mindful of, what I should probably bring and what she knows I should not bring. There are some daughters and mothers that can drive each other nuts sometimes, let's be honest it can happen to be the very best of us but let those little habits slide. You'll be in Europe, for goodness sake!